The service changes for the October-November period are relatively minor. 501 Queen streetcars will operate from Neville to Roncesvalles, but they will divert via Church, King and Spadina for about three weeks during the reconstruction of the intersection at McCaul. 501L Long Branch and 501M Marine Parade bus service continues as it was in September. Bus trippers have been shifted from King to Queen where they will operate between Woodbine and Sunnyside. Kingston Road services 502 and 503 continue to operate with buses. The 511 Bathurst route continues to operate with buses although the introduction of Flexitys on 512 St. Clair is releasing CLRVs that could be redeployed elsewhere. How quickly streetcars will return to temporarily bused routes remains to be seen. Although schedules for routes at the Renforth Station (formerly “Gateway”) were altered in September, this facility is not yet complete and routes continue to operate to their former termini. Through the fall and winter of 2017-18, the TTC will be converting all remaining stations and entrances to use fare gates and Presto card readers. There are station-specific notices, but for readers’ convenience I have consolidated all of the information here. The first two pages of the following pdf contain the information in textual format, and the remainder is a Gantt chart. The information is current as of September 9, 2017. Stations are in sequence by line. If a station is not shown, either it has already been converted or the TTC has published no information about it. There are variations on the way the program will roll out depending on the station. Some entrances/stations will not close for this project, but will be converted in stages with access maintained throughout construction for passengers. Some entrances/stations will have only selective late night closings (generally after 11pm), and work will otherwise take place maintaining a pathway for passengers. Some stations/entrances will close completely for some or all of the conversion project. There will be weekend closings for selected stations in the downtown “U” on Line 1 YUS, but many of the secondary entrances will close completely for over a month. During construction, riders will not be able to purchase fare media from the station collectors while their booths are close. Even after the shutdown periods, work will continue at some locations for an extended period. Following the conversion, riders will still be able to pay with all fare media at the main entrance of stations, but the secondary entrances will support either a combination of Metropasses and Presto, or only Presto in some cases. Details are in the linked chart. During the early and weekend closures subway trains will not stop at the station. Customers should use [nearby] stations to access the subway or board a northbound or southbound 97 Yonge bus. Of course, the 97 Yonge bus does not run on lower Yonge Street except during weekday peaks when the stations will be open. The TTC has been advised of this and will, in due course, fix the affected pages. No need to kvetch here in the comments. As part of the September CEO’s report to the TTC Board, management made two presentations on the evolution of service quality on the surface and subway networks. For the surface routes, Rick Leary (Deputy CEO and Chief Service Officer) ran through an overview of two sets of statistics: on time performance and the numbers of short turns. For the subway, Jim Ross (Deputy Chief Operating Officer) reviewed schedule versus actual capacity provided on Line 1 YUS as well as a breakdown of the types of incidents that produce most delays. Is A TTC Bus Technology Gerrymander In The Works? At its September 5, 2017, Board Meeting, the TTC considered a report recommending the purchase of 440 “clean diesel” buses from Nova Bus, a division of Volvo. This sort of thing would normally sail through because the Board has considered and approved future bus plans at previous meetings. In this particular case, one important aspect of the order is that 325 of the vehicles would be delivered before the deadline for federal PTIF (Public Transit Infrastructure Fund) grants that end on March 31, 2019. A further 115 buses would be procured with the “standard” arrangement for TTC capital financing, but no federal contribution. This procurement went through a common pattern with an RFI (Request for Information) in October 2016 and an RFP (Request for Proposal) in April 2017. Two proposals were received, one from Nova and the other from Flyer Industries, and both met the technical requirements. The decision to award to Nova Bus was based on pricing (Nova’s bid was $300.5 million while Flyer’s was $345.0 million). In an unusual move, the Board entertained a last-minute addition to the deputations list, two representatives of a builder of battery buses, BYD. This is a Chinese manufacturer with an office in Los Angeles and, more recently, representatives in Canada. BYD did not bid on this RFP because it specified clean diesel technology which they do not supply. Their presentation and associated Q&A went on at some length, far moreso than public deputations are normally allowed, and it was quite clear that this was a sales pitch for their product. 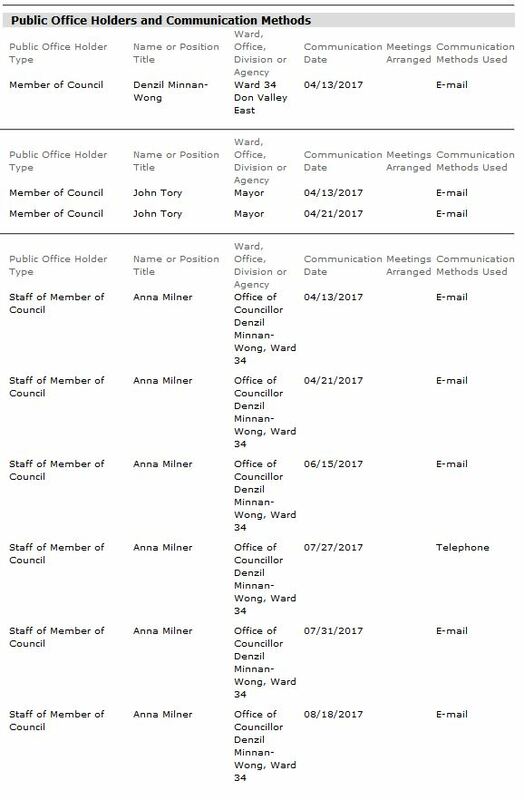 In any other Board meeting, this would have been stopped as an abuse of process, but this situation was under the charmed support of Deputy Mayor Minnan-Wong who is a member of the TTC Board. Many claims were made for BYD technology and for the scope of the battery bus industry that went largely unchallenged. In response, TTC management advised that they would be issuing an RFI for alternative technology buses to four supplies, including Nova and Flyer, later in the week, and that they planned to bring back an overview report to the Board in November. The situation became more interesting with a motion proposed by Minnan-Wong and eventually approved by the Board with only two votes against that would reduce the contract award to Nova to 325 vehicles and pursue the remaining 115 as a potential for a different propulsion technology. Another wrinkle was added by Chair Colle (one of the two “no” votes on Minnan-Wong’s proposal). The PTIF funds allocated to Toronto were split between the TTC and the City, and the TTC has found projects that can qualify for this funding. However, the City is unable to spend all of its available funding and is looking for projects that could soak up the shortfall. Colle proposes that TTC management report on what projects might be brought forward for this purpose. During the discussion, there were comments pro and con the TTC’s becoming embroiled in yet another new transit technology. They have already been burned by the Hybrid Bus fiasco, ironically a scheme they were forced into by a combination of environmental enthusiasm at Council and federal subsidies that were only available for “green” technology. A good deal of that federal money went not to additional buses, but to paying the extra cost of the hybrid vehicles. The BYD reps proposed exactly the same thing for their products – yes, they were more expensive than regular buses, but the feds would pay and the TTC could save money in the long run on operating costs. Of course this approach would negate the ability to buy more transit infrastructure with the federal funding, and of course would not apply to any buses bought outside of the PTIF envelope. TTC management including CEO Andy Byford made the point strongly that it is staff’s job to get service out onto the road, and the 440 bus order was to allow retirement of the oldest and least reliable vehicles. Battery bus technology is evolving quickly, but beyond some large fleets in China, cannot be said to be well-established in North America or Europe. The lobbyist company, Earnscliffe, is well-known. 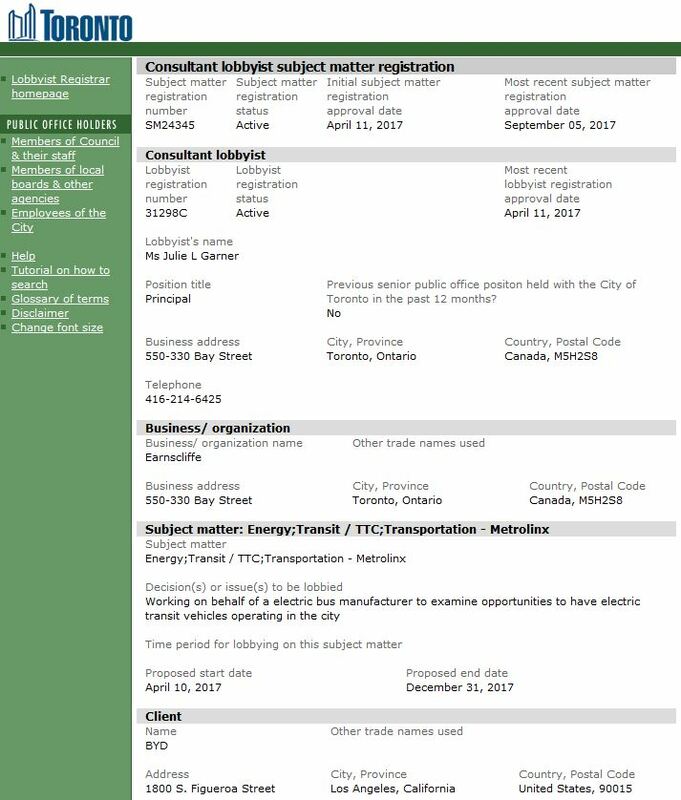 The initial contact by them corresponds to the point at which the TTC issued its RFP for diesel buses in April 2017. Any company is free to lobby, but it is quite unusual for this to result in a direct presentation to a Board meeting where a contract award is up for approval. We have learned recently how political meddling has influenced advice and decisions at both Metrolinx and the City of Toronto, and this continues a disturbing trend. Worst of all, the TTC staff report on alternative technology buses will now be under a cloud. Will it be a technically honest report, or will it be spun to suit the position of a well-connected member of the Board? 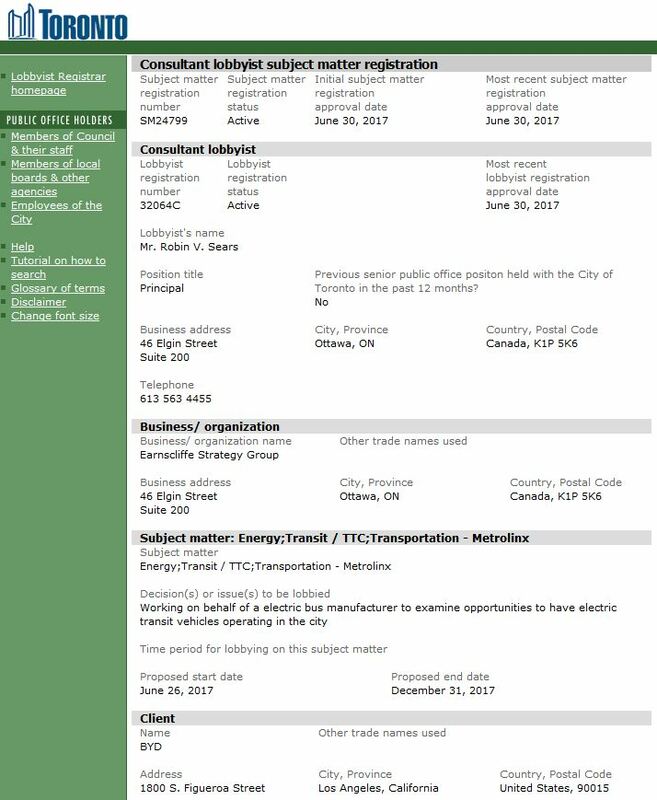 By giving credibility to BYD’s presentation, has the Board placed TTC staff in the unenviable position of debunking claims made by one would-be vendor? Will there be another round of vendor presentations attacking whatever staff brings forward? Members of the TTC Board just love to think of themselves as progressive, forward thinkers who will embrace potential transit improvements. One Board member, Councillor De Baeaemaeker, even launched into an attack on “clean diesel” by reference to all of the pollution created by exploration, extraction and refining, while carefully avoiding the fact that a great deal of Ontario’s base electrical load comes from nuclear power. That is where overnight charging would come from, but this delicate point was not part of his thesis. The irony here is not lost on those of us who followed the TTC through its abandonment of electric buses a few decades ago when beautiful, clean compressed natural gas was a panacea to solve both our diesel woes and TTC management’s distaste for trolley buses. Battery buses may well have a future in Toronto and in world transit generally, but the way this has been introduced at the TTC leaves a foul taste, a sense that the fix is already in. Toronto’s transit technology choices have been gerrymandered more than once in the past to suit politicians and businesses looking to cash in on new technology. We have had enough of this, thank you. Design changes at Humber Loop to address various issues that were not picked up in the original project. There is a higher than expected water table along the stretch of the Queensway from Ellis Ave to Colborne Lodge Dr. Construction started to the east of Colborne Lodge and should have progressed westerly towards Humber Loop. Due to the water table issue, construction proceeded westerly to Colborne Lodge Dr. where it had to be suspended. To allow engineers time to evaluate the situation and develop a solution, construction then resumed to the west of Ellis Ave and will move westerly to Humber Loop. Construction between Colborne Lodge and Ellis will resume at the tail end of this project. In total, there is approximately 2 months of slippage in the schedule for this part of the Queensway project. This slippage may affect the Q2 2018 commitment of reinstating streetcar service from Roncesvalles to Humber Loop. TTC staff is working with the contractor to investigate options to recover time. Parkside to Colborne Lodge: Track installation completed. Overhead poles in place. Colborne Lodge to Ellis Avenue: Minimal work completed due to water table problems. Ellis Avenue to South Kingsway: Right-of-way grading and pole base installation in progress. Track formerly stored between Windermere and South Kingsway has been moved to the streetcar lanes in front of St. Joseph’s Hospital. Humber River Bridge: The centre span used by streetcars has been rebuilt, but is temporarily hosting all road traffic while the north (westbound) and south (eastbound) spans and approach ramps are under construction. This work has progressed to the point that some concrete placement has been done. Humber Bridge to Humber Loop. Pole base installation in progress. On Lake Shore, demolition of the track from Dwight Ave eastward has crossed Symons Road which was expected to be the point where there is a transition from monolithic concrete to discrete layers. New track is in place from Dwight to approximately Lake Crescent. For updated construction photos, please see my article with galleries tracking this work. The long-suffering riders of the 501 bus service west of Sunnyside will have to deal with this arrangement for several more months and will not see streetcar service until mid-2018. This will all get nicely settled until 2019 when the project to rebuild King/Queen/Roncesvalles will be launched together with construction of a streetcar right-of-way from Parkside Drive to Roncesvalles.